Behind the political figure was a family man, a man of literary distinction, an artist, a great lover of pets, and a tinker — he had many hobbies. Today on Biographics we paint the complex picture of “The Lion,” Sir Winston Churchill. 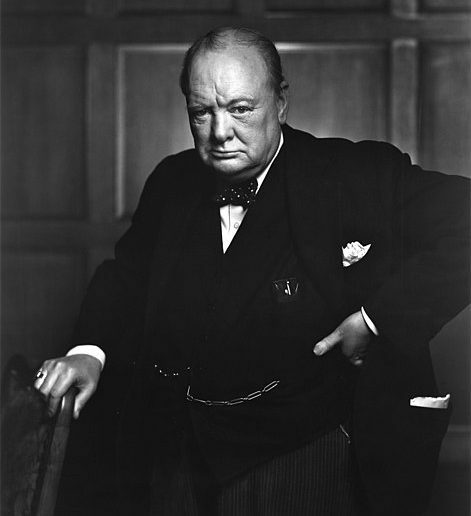 Sir Winston Churchill was born on November 30, 1874 into the upper echelons of British society. His father was Lord Randolph Henry Spencer-Churchill, a prominent politician and the third son of the of the seventh Duke of Marlborough. Churchill’s mother, Jennie Jerome, was an American beauty and socialite, the daughter of a wealthy New York stock broker and financier. The glamorous couple would seem like a match made in heaven but they lived mostly apart and carried on separate lives. They also couldn’t be bothered with the young Winston; the very privilege of his pedigree didn’t afford him the kind of love and affection he sought from his parents. Sadly, throughout his life, both father and mother were distant and neglectful. Winston Churchill as a young boy, aged 7, in Dublin, Ireland. Winston was just seven years old when he was sent away to St. George’s School at Ascot, a boarding school. It was not uncommon for schoolchildren in upper-class society to be sent away, but his mother dropped him off at Paddington Station alone to catch the train. At his first school, Winston was bullied and bruised by the headmaster who commonly “birched” the students, a form of corporal punishment that involved striking the bare bottoms of boys that misbehaved. With visible scars on Winston from the beatings, and pleas from his loving nanny, his parents withdrew him and placed him at Brighton School in 1882. 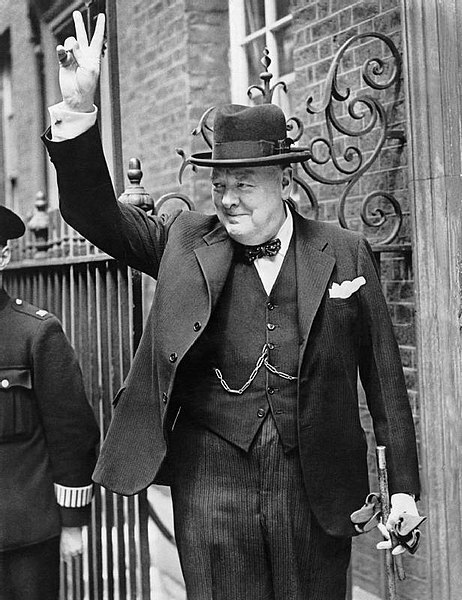 Winston Churchill in Downing Street giving his famous ‘V’ sign. Winston Churchill nearly died from a self-imposed act of bravado at the age of 18 when he jumped off a bridge. He would endure three days of unconsciousness, a ruptured kidney, and three months in bed. It happened when the teenager was playing chase with his 12-year old brother Jack and 14-year old cousin while vacationing at their aunt’s estate. According to Churchill in his 1930 memoir, he was “trapped” on a “rustic bridge” with brother at one end and cousin at the other. Rather than be “captured,” Churchill lept from the bridge, aiming for a pine tree to slide down. He greatly misjudged the distance and fell the full height onto the hard ground. Churchill was extremely lucky to survive but it wouldn’t be his last brush with death. During his life Churchill was prone to accidents, including crashing a plane while learning to fly, nearly drowning in a lake, falling several times from horses, and getting hit by a car while trying to cross New York’s Fifth Avenue. Due to his poor grades at Harrow, it appeared Churchill’s only chance at a career was through the army. It took Churchill three tries to pass the admittance exam for the Royal Military College at Sandhurst. Churchill described taking the Latin portion of the exam and leaving it completely blank except for his name, a number, and “a blot and several smudges.” His father had wanted him to be in the Infantry but his scores were only good enough for the Cavalry. The new training at Sandhurst excited Churchill and over the next 18 months Churchill thrived. He recalled, “I was no longer handicapped by past neglect of Latin, French or Mathematics. We had now to learn fresh things and we all started equal. Tactics, Fortification, Topography [mapmaking], Military Law and Military Fortification, formed the whole curriculum. In addition were Drill, Gymnastics and Riding.” Churchill finished twentieth out of 130 in his graduating class. Churchill craved action and showed no fear on the battlefront. He knew he was destined for great things and would prove it to the world…war provided the perfect opportunity. Churchill served in the British Army for only a short time, from 1895 to 1899, and during the same time wrote military reports for newspapers and two books, The Story of the Malakand Field Force and The River War. In 1899, Churchill tried to win election in the House of Commons and failed. Without hesitation, he traveled to South Africa to cover Britain’s war with the Boers as a London Post war correspondent. At the age of 25, Churchill arrived in Cape Town with 18 bottles of scotch whiskey and a guarantee of $150,000 in today’s money, for a four-month assignment. One day, Churchill admitted to his brother, “There is no ambition I cherish so keenly as to gain a reputation for personal courage.” He would soon get the chance to earn that reputation in South Africa. While covering the war, Churchill was aboard a train with soldiers sent on a reconnaissance mission. The train was suddenly ambushed by the enemy and Churchill immediately sprung into action. Under fire, he acted like a decorated general and ordered the soldiers with him to flee to safety. Most of them did but Churchill was captured as a prisoner of war and sent to Pretoria. Churchill’s conditions in captivity could have been worse. The Boers allowed prisoners to buy cigarettes, beer, and newspapers after all. But Churchill hated every moment of it, feeling the opportunity for glory slipping him by. Winston Churchill Quotes About Life You Will Never Reach Your Destination If You Stop And Throw stones at every dog that barks. One night, with no real plan of how to make it out of the 300 miles of enemy territory, he made a daring escape. A massive manhunt ensued and the fugitive Churchill was wanted “dead or alive.” He avoided capture, travelling at night and drinking water from streams and when he could go no further, he took a chance by knocking on a stranger’s door. On the other side, he knew not whether friend or foe. Saved by pure chance or fate, it was an Englishman who answered. “I felt like a drowning man pulled out of the water,” Churchill would recall. The Englishman was John Howard, a coal mine manager who hid Churchill in a pitch-black mine before he could be smuggled to safety…rats were his only company. In Britain, the story of an English lord’s son escaping prison camp and humiliating the Boers was a boost to the nation. He became a hero and a celebrity overnight. Winston Churchill as a new Member of Parliament in 1901. Churchill was a Conservative (Tory) when he first stepped into the House of Commons but he repeatedly clashed with his party on a number of issues. Free Trade was crucial in his mind and in 1904, it was his party’s support of tariffs that made Churchill ‘cross the floor,’ to the opposing Liberal side. It infuriated his fellow Conservatives but it proved to be great timing; the Liberals took control soon after. As a newfound Liberal, Churchill concerned himself with social reforms and laid the groundwork for the post-war ‘welfare state.’ Churchill again “ratted” — or switched sides — back to the Conservative Party in 1925. The flippant politician was highly criticized for the moves and he was seen as an untrustworthy opportunist. Churchill’s greatest political failure, the one that nearly ruined his career, came in 1915. World War I was at a stalemate along the Western Front with Allied troops engaged in deadly trench warfare. Anxious to end it, Britain’s War Cabinet authorized a bold military attack, the mastermind of the 40-year old First Lord of the Admiralty, Winston Churchill. The campaign would send troops over 1,000 miles to the east, establishing a second front to eventually seize Constantinople and take control of the sea route from Europe to Russia. The plan involved a naval attack through the Dardanelles strait, then a land invasion on the Gallopini peninsula in modern day Turkey. Lack of intelligence, incompetence, and hesitation by military commanders created the perfect storm and the campaign went horribly wrong. Half of the ships were lost and a bloodbath on the shores lasted nine months. In all, 46,000 Allied troops and 65,000 Turkish lost their lives. Right or wrong, Churchill bore the brunt of the failure and it forced his resignation from politics for a time…Churchill then returned to the warfront. The Gallopini campaign haunted Churchill for decades — “Remember the Dardanelles,” was a favorite taunt from political opponents throughout his career. A second controversy would plague Churchill for a decade and send him into political exile, a period known as the “Wilderness Years.” In 1929, a debate erupted over self-government in India, at the time under British rule. Churchill was no doubt an Imperialist and was vehemently opposed. He also had no love for Gandhi; he saw him as a threat to the British empire and went so far as to say, “Gandhi should not be released on the account of a mere threat of fasting,” and “We should be rid of a bad man and an enemy of the Empire if he died.” Except for the most right-winged of Conservatives, Churchill was alone in his position. Much has been written about Winston Churchill the statesman, but what was ‘the bulldog’ like at home? Who was he to his family and friends? When Clementine Hozier met the 29-year old Winston in 1904 at a dance, she wasn’t impressed. He didn’t ask her to dance, just stared, and “never uttered one word and was very gauche.” Four years later they would meet again at a dinner party and this time a romance blossomed. 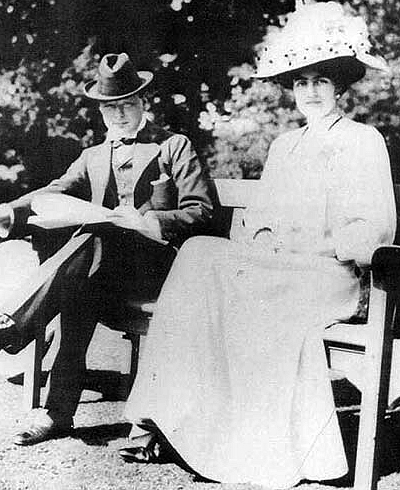 The couple married in 1908 and would endure 57 years together until Winston’s death at the age of 90. Winston Churchill quotes – a pessimist sees the difficulty in every opportunity an optimist sees the opportunity in every difficulty. Even though Clementine’s politics differed from Winston’s, she was fiercely supportive and made standing by her man her number one priority. She quietly advised him and was the only person who could reprimand his behavior. Clementine once said, “she would have loved to have been a statesman in her own right if only she had been born with trousers rather than petticoats.” Winston was overbearing and temperamental at times but he was always transparent in his love for his wife, proudly boasting to Roosevelt, “I tell Clemmie everything.” On occasion, the couple would fight though — money was a constant worry for Clementine who was born into the aristocracy but wound up penniless in her youth. Winston overspent, enjoyed gambling, and was in and out of debt. During one passionate dispute, Clementine famously threw a plate of spinach at her husband (it missed). And, she never quite forgave him for buying the family home and money pit Chartwell; doing so on the sly when she was laid up from giving birth. Winston Churchill (1874-1965) with fiancée Clementine Hozier (1885-1977) shortly before their marriage in 1908. The couple had five children but only four would survive into adulthood. Their third child, Marigold, died at the age of two and a half from septicemia (infection of the blood) — a condition modern-day antibiotics would cure. Clementine “shrieked in agony, like an animal in mortal pain,” upon her daughter’s death. One year later, the Churchill’s fourth child, Mary, was born. Winston was delighted to have the nursery in use again. Churchill’s duties as statesman often took him away from home but he was devoted to his family. Determined to be different from his own parents who were distant and cold, whenever he could, he dotted on his children. He built them a treehouse at the family home, and used his skills as a bricklayer, to construct a little summer house for Mary. Over 40 years at Chartwell, Churchill proudly improved the property by his own hands, building ponds, structures, and bridges. The Churchill’s had a multitude of pets — domestic and exotic. Churchill was an animal lover his whole life. As a teen in 1891, he even sold his bicycle to buy a bulldog named “Dodo.” At the family home they had both cats and dogs — as well as pigs, fish, butterflies, sheep, horses, and black swans. There was even a parrot called “Charlie” who it was rumored Churchill taught to squawk obscenities against Hitler and the Nazis — though this hasn’t been proven and is likely a myth. When not enamored with politics and acting as “savior of his country” Churchill was writing, painting, playing polo, laying bricks at the family home, or vacationing with friends in Monte Carlo or another exotic location. At the war’s outbreak then Prime Minister Neville Chamberlain brought Churchill back into the fray as Britain’s First Lord of the Admiralty, the same position he held during the first World War. Chamberlain had tried, and failed, to strike a peace deal with Hitler and he showed himself incapable of turning the rapid tide of fascism. Chamberlain lost the support of his cabinet when British troops couldn’t prevent the occupation of Norway in 1940. Chamberlain resigned, and Churchill took over as Prime Minister at the “darkest hour.” The same day, May 10, Hitler invaded Holland, Belgium, and the Netherlands. To forge the big three alliance, Churchill cultivated a friendship with the American president, Franklin D. Roosevelt to convince him to join the war effort. He invited himself to the White House and arrived two weeks after the bombing of Pearl Harbor. The Prime Minister stayed three weeks, through Christmas, and well past his welcome in Eleanor Roosevelt’s eyes. But, it was critical to solidifying their alliance and winning over the Americans. The two bonded over daily lunches and late-night strategizing — Churchill was known to work late into the night. By the time he left, F.D.R. found he missed his friend and sent a note to Churchill in London, it read “It is fun to be in same decade with you.” With the Americans now in the war, and the Russians fighting on the side of the Allies, Hitler’s armies were pushed back and victory was declared on May 8, 1945 in Europe. Three months later in the east, Japan surrendered, marking the end of World War II. In a surprise the same year, Churchill did not win re-election. Following the war, Churchill continued to influence world affairs. He gave his speech on the “iron curtain,” about the USSR threat and was strongly in favor of Britain’s independence from the European Coal and Steel Community, which was set up after the war to neutralize European competition for natural resources. Churchill served as Prime Minister again in 1951 and resigned at the age of 80. By that time he was in deteriorating health. Old Friends Get Together, 1951 The leaders of NATO’s newly created military arm, the Allied Command Europe, were taken from the ranks of the coalition that had won World War II in the west. The first Supreme Allied Commander, Europe, was American General Dwight D. Eisenhower; his British Deputy was Field Marshal Bernard Law Montgomery. They are shown here at a reunion of the British Eighth Army on October 19, 1951. Churchill, leaning across a seemingly disgruntled Eisenhower, would again become Britain’s Prime Minister five days later. Churchill was intent on leaving his mark on history, not just through clamoring for fame and power or placing himself at the center of action. He would write his own story and solidify a favorable view to be passed on through the ages. At the end of World War II, Churchill wrote his best-selling series, The Second War World and won the Nobel Prize in Literature in 1953. In the same year he was knighted by Queen Elizabeth II. In 1965, after suffering a stroke two weeks earlier, Winston Churchill passed from this life into the next. It seemed the whole world felt the loss; and reporters remarked it was the end of an era. The Queen saw to it that Churchill’s funeral was the grandest of any commoner since 1852, “on a scale befitting his position in history.” His body lay in state in Westminster Hall for three days and nights and no fewer than 320,000 people filed past to pay their respects. Winston Churchill with American generals on a balcony watching Allied vehicles crossing the Rhine.